Answer: Yes, there are at least three reliable methods to assess the degree of light pollution in a given area. But before I explain, take a look at the image above. It’s a composite of night views over the entire planet. Click on it to see an even larger image. If you live in a major city, you can probably find the spot of light that corresponds to it. And therein lies the problem of light pollution. If those lights can be seen from space, that means the light is traveling upwards through the atmosphere. The air scatters the light in all directions and reduces the contrast between sky and stars, creating what we call a “light dome” over large metropolitan areas. You can see a photo of the huge light dome over Phoenix, Arizona in my June 3, 2013 post. Just scroll down to the first thumbnail. So if you want to rate the darkness of the sky at your own location, there are three methods available. But whichever you use, the rating should be done on a clear cloudless night when the Moon isn’t up. In addition, if you choose to use either of the first two methods, give your eyes at least 20-30 minutes to become dark-adapted. And, of course, turn off all your outside lights. Method 1 is the simplest. It’s the “Great Square of Pegasus” test I described in my October 24, 2011 post. That was back in the days when Sky Lights was running in a local newspaper and not yet online, so excuse the crude grayscale image. Unfortunately, the Great Square of Pegasus rises around 02:00 this time of year, so you’d have to stay up pretty late to do this test. And it’s really only accurate if you wait until the Square is overhead, which would be just before dawn. Method 2 can be done any night of the year, but requires that you have charts (or software) that tells you the magnitude (apparent brightness) of specific stars. Rating your sky darkness then becomes a matter of how faint a star you can see with the naked eye. The average human eye can see stars down to magnitude +5.0. An above-average eye (in terms of light sensitivity) might be able to score a magnitude +6.0 star, especially if the eye is dark-adapted. If you can see magnitude +5.0 stars, you have very dark skies. From inside a large urban area, you’ll be lucky to see magnitude +3.0. 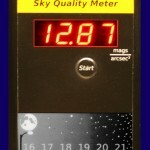 Method 3 is the quickest way to rate your sky darkness, but you’ll need a sky quality meter (SQM). Click on the thumbnail below to see my SQM showing the reading inside my office, with indirect light from my computer monitor and a skylight illuminating the room. 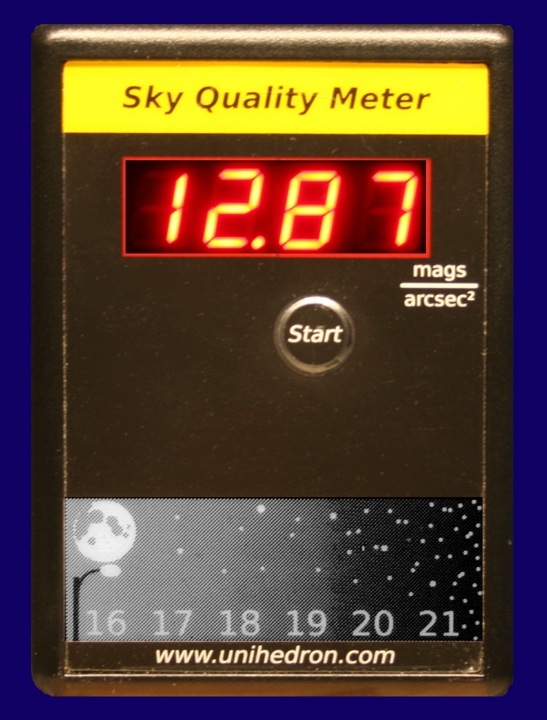 An SQM will cost you $120 for a model like mine, but if you want to track the (mostly) inevitable increase in light pollution at any location, it’s the best way to get a quantitative measurement. I’ve been taking readings for several years now, and can already see the effect of the continuous growth of Phoenix, even though the city is 30 miles south of my location. Caution: Never use an SQM outside during the day. Its sensor will be overloaded and can be damaged. It’s important to note that the SQM readings are based on a logarithmic scale. That means a difference of 1.0 corresponds to a factor of 2.512 in actual brightness. It’s the same scaling factor used to measure the magnitude of individual stars. Interestingly, if you try to take a reading inside a totally dark closet, you get nothing. The device fails to lock on to any specific number, since it needs at least some photons of light to operate. In practice, all you need to do is walk outside, point the device straight up at the sky, and push the button. A few seconds later you have your SQM reading. Obviously, you don’t want to be under a tree or overhang. You need an unobstructed path straight upward. Also, when I take my readings, I wait till just after 11:00 pm. Based on the lighting ordinances for Phoenix, that’s when most of the billboards are required to shut down. Not all do, of course, but it makes a noticeable difference in the SQM reading. So as you can see from the main graphic, large parts of the planet are already hopelessly light-polluted. Even in Arizona, which supports several major professional observatories, it’s getting harder to do astronomy. The astronomy community is fighting for stricter lighting ordinances, but the advertising industry has their own lobby, and some pretty deep pockets. Thank you for the thorough explanation. Method 1, observing the number of stars inside the Great Square of Pegasus: is there a way to determine other times and days where it would be at optimal viewing, i.e. low or no moonlight and an earlier time at night? ENE is my darkest viewing area. Also, using an SQM pointed straight up would be the official reading? I would imagine if I pointed it to different parts of the night sky, I’d likely obtain different readings. If cities required some sort of overhang atop an LED ad sign, would that reduce the light emissions into the sky? If so, is it being considered, since it is unlikely that LED signs will be banned? Thank you for having this blog. It is extremely useful for a novice like me! ENE is my darkest viewing direction also, and that’s close to where the Great Square rises. You’ll want a date when it rises at sunset, and is up all night (like a planet at opposition). For the Great Square, that starts around September. Just use Cartes du Ciel to find out the days when the Moon won’t also be up. Of course, you can see the Great Square at other times, but you have to either stay up late or get up early to catch it overhead close to midnight. You can point an SQM in other directions if you want to get an idea of where the light pollution is coming from, but that’s as easily done with your eyes. So the recommended procedure for measuring your overall sky quality is to point it straight up. LED billboards are a real problem, since half the light they generate goes upward. An overhanging shield would indeed help, but it would significantly add to the cost. I doubt the astronomy lobby could force that to happen retroactively, so it looks like we’re stuck with that sloppy engineering.